The Titan Hi-Power Lug R-1 is an industrial tractor tire specially designed for those who need deep traction and stable footprint. Ideal for industrial applications, the Titan Hi-Power Lug R-1 is able to deliver traction and torque without compromising stability. This prevents the vehicle from slipping "something you don™t ever want to happen when you™re working on uneven terrain using heavy equipment. The Titan Hi-Power Lug R-1 features a single bar design with wide overlapping lugs which help propel your vehicle out of loose surfaces like mud, sand, and wet soil. These lugs also make the Titan Hi-Power Lug R-1 have self-cleaning capabilities allowing you to better focus on your task instead of the debris stuck on your tire. Helping with its treadwear and durability is the deep tread. 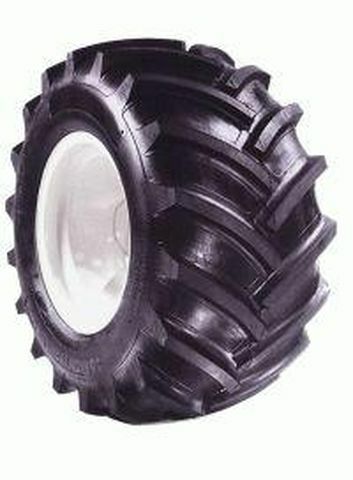 This is further enhanced by the strong nylon carcass which increases the tire™s resistance against mechanical failures. 11.2/--24 N/A 1,650 lbs 18 psi 42/32nds N/A N/A N/A 24"
Purchase includes the Titan Hi-Power Lug R-1 tire only. The wheel rim shown in the picture is not included. Picture provided is a stock picture from the manufacturer and may or may not reflect the actual product being ordered. All Titan Hi-Power Lug R-1 tires are continuously developing with manufactured improvements. With that said, Simple Tire and the manufacturers have the right to change these tire specifications at any time without notice or obligation. Please Note: Specifications of the Titan Hi-Power Lug R-1 tires shown above are listed to be as accurate as possible based on the information provided to us by Titan tires.